There's a page on Wells from my Vanishing BC wanderings, click here. 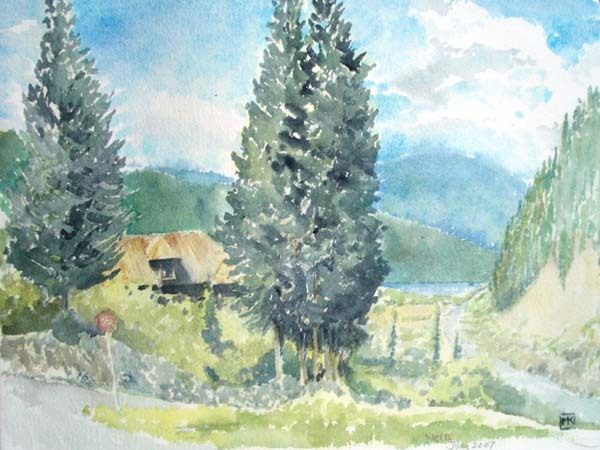 Above: 2006, a double page in the sketchbook, from the edge of town looking towards Moose Island and the dying forest. This is the "red stage," I think they call it, the first year of pine-beetle infestation, the needles on the trees turned to copper. Immense flat swampy meadow with a few aspens or cottonwoods, interlaced with shallow buggy creeks. A landscape of stripes. Below: 2007, another double page. It was a cloudy, cool day, very unappealing and mosquitoey outside, so all the students set themselves up in the vacant top-floor classrooms of the Wells School (where the IMA programs are held) to take in the view out to the meadow and Moose Island. It's year two of the beetle infestation -- the "grey stage," I think it's called, with the trees standing dead in their boots on the hillsides. I liked the view as from it there was something of the sense of Wells as a collection of dollhouses -- the tiny bungalows built in the '30s for the miners and their families. 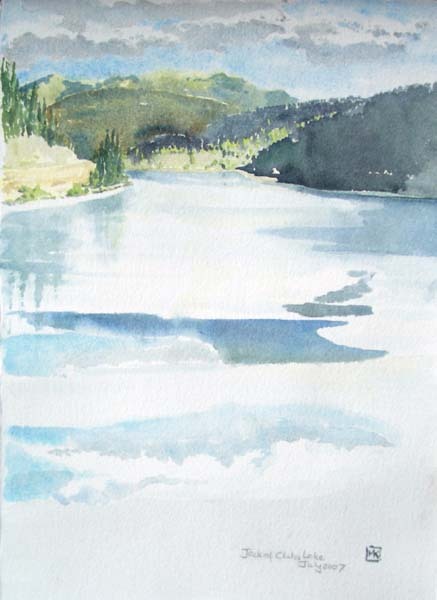 Both years we spent mornings at Jack of Clubs Lake trying to capture the shifting light and reflections on its surface. 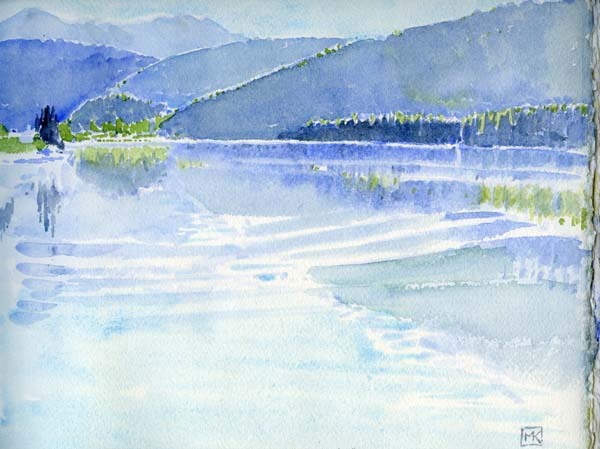 The watercolour above is from 2006 and very early in the morning, about 6:30 am, the colours still blue and back-lit and the faintest ripple on the lake's surface. The one on the left is from 2007, later in the morning, one of those days where the changing breaths of wind render the lake silver and opaque one moment, mirror-bright the next. The edge of Wells, where the road climbs up to the commercial town, with Jack of Clubs Lake in the distance. 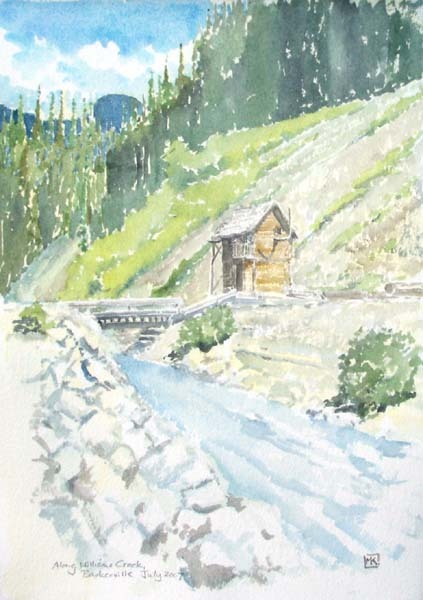 The only watercolour I did from our trips into Barkerville -- a curious dwelling along the edge of Williams Creek. There's a particular quality to the BC Interior -- trees and rough shrubs and grasses clothe the land until it's dug or damaged, after which it stays rock and gravel, never healing itself.